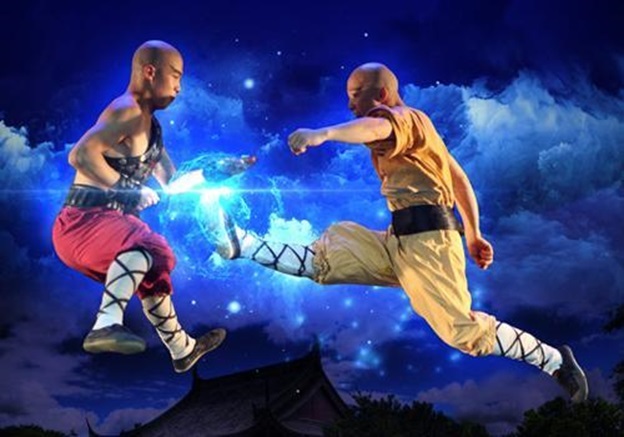 The Legend of Kung Fu in Branson is a live show that features a cast of 17 performers sharing the ancient art of Kung Fu in a theatrical setting. This fascinating show has performed over 4,000 times around the world in countries such as United Kingdom, China, Russia, Canada, and Japan. And now, Legend of Kung Fu has found a new home in Branson, MO. This theatrical production combines the elements of kung fu, acrobatics, story-telling, modern dance and original music to celebrate the skill of martial arts. Also known as Cirque du Soliel, the show is combined with the story of the art and skill of Kung Fu. This Broadway-style show was chosen as the main show for the 2008 Beijing Olympics and is now one of the largest theatrical productions in Branson. The Legend of Kung Fu is filled with brilliant martial arts action, acrobatic stunts, and emotion filled dancing. This show gives a unique opportunity to all audiences to see majestic scenes, lighting, sound and special effects as the story unfolds. The show shares a story about a fearful, young boy named Chun Yi when he joins into the apprenticeship of a Buddhist monk. Under the teachings of a wise master, this young boy struggles against distractions as he attempts to find a way to adapt to the strict discipline lifestyle that he is facing. Along the way, the young boy learns the skills of martial arts and studies hard collecting vital life energy. In this entertaining show, you’ll learn the amazing transformation of Chun Yi during the tough times of his life that he goes through. This unique action-packed entertainment show at The White House Theater in the entertainment district in Branson offers a perfect cultural experience for all ages. This high-energy production is one of Branson shows that features cast of more than 60 performers displaying ancient art of Kung Fu in theatrical setting. The show has entertained more than two million fans around the world. The Kung Fu Show was a popular television series from 1972 to 1975. Stars in the show included David Carradine and Chris Potter who portrayed as a father and son. The two both trained the martial arts of kung fu. Carradine played as Shaolin monk and his son Peter, played as police detective. The television series was re-aired for four seasons, from 1993 to 1997 and was broadcast in over 70 countries. This entertaining production show in Branson has been on tour in China and North America for the past 7 years. The first two seasons of The Legend of Kung Fu have been big hits for martial arts enthusiasts. This unique style of action-packed production show is like no other as you will get to enjoy enticing meal with delicious Oriental dishes. So, if you want to learn some interesting stories about kung fu, watch the amazing entertainment show of the Legend of Kung Fu at the White House Theater in Branson.